What Day Of The Week Is August 17? 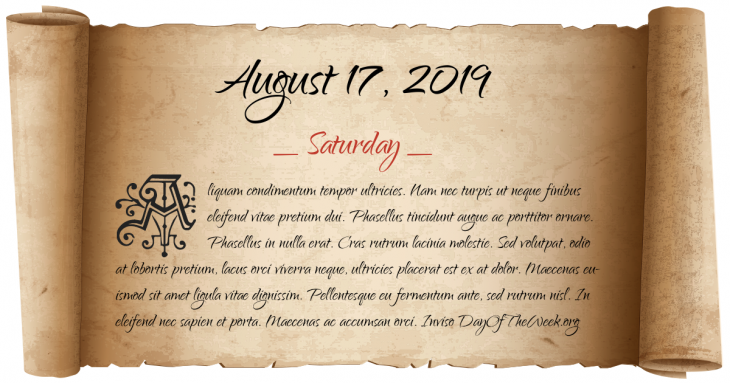 August 17, 2019 is the 229th day of the year 2019 in the Gregorian calendar. There are 136 days remaining until the end of the year. The day of the week is Saturday. A Byzantine army is destroyed in the pass of Trajan’s Gate by the Bulgarians under the Comitopuli Samuel and Aron. The Byzantine emperor Basil II narrowly escaped. World War I: Battle of Stalluponen – The German army of General Hermann von François defeats the Russian force commanded by Pavel Rennenkampf near modern-day Nesterov, Russia. Quake Lake is formed by the magnitude 7.5 1959 Yellowstone earthquake near Hebgen Lake in Montana. East German border guards kill 18-year-old Peter Fechter as he attempts to cross the Berlin Wall into West Berlin becoming one of the first victims of the wall. Azaria Chamberlain disappears, probably taken by a dingo, leading to what was then the most publicised trial in Australian history. Who were born on August 17?